Back in Japan after 5 years, I made sure I could take photos upon my arrival at Narita International Airport. I was not sure how strict they were at the airport regarding taking photos so I was cautious and tried not to inconvenience others as I took a few pictures. Of course, taking photos at the immigration area is prohibited so I did even attempt to take any pictures there. All the photos in this post are in public places and gives an idea about how the airport looks like from the perspective of an arriving passenger. Upon deplaning, passengers are guided to proceed towards the arrival area where passengers with connecting flights are likewise guided to the transfer area. While walking towards the immigration area, I took a photo of some of the aircraft docked at Narita. This is an Alitalia plane using its familiar logo and livery from way back. I don’t remember if they’ve changed or “updated” their logo and livery recently. Narita Terminal 1 is large and so to proceed to the arrivals, transfer areas passengers may use the moving walkways for their convenience. I took a photo of our plane, a Delta 747-400. Delta took over NorthWest, which I used to take for trips home when I was studying in Japan in the 1990s. Their fares are less expensive than JAL, ANA and PAL among full service airlines connecting Manila and Narita. After splitting up with passengers with connecting flights, we were guided to the immigrations area at the airport. Prior to the area, passengers have to go through quarantine, which is a standard check they do at airports to make sure people are not bringing in some disease that could be spread to the general population. After clearing immigrations, passengers descend to the baggage claim area. Passengers connecting to domestic flights bound for other destinations in the Japan are advised to take their luggage before proceeding for domestic travel check-in. Here’s another photo of the luggage carousel. Notice the signs advising passengers against taking their carts too close to the carousel. This allows for space for people taking their bags from the belt rather than have the area congested with carts. After clearing customs, arriving passengers might want to change their money to Japanese Yen before purchasing tickets to travel to their intended destinations or to buy some refreshments after a long flight. There are banks proving currency exchange services at the arrival area. Signs at the airport gates guide passengers to the locations of bus stops and taxi stands. There are also guide signs for trains serving the airport. Airport Limousine Bus services are available and you can purchase tickets at their counters at the airport arrival area. While more expensive than rail transit, limousine bus services may be the most convenient in terms of routes and destinations. The service is recommended to people staying at hotels along the bus routes. Information on Terminal 1 North Wing arrivals and domestic departures at Terminals 1 and 2 are provided at the airport. For those taking their cars or taxis to their destinations, road traffic information for expressways are shown. Segments in red indicate traffic congestion, which is quite common when approaching central Tokyo. A small cafe inside the airport for passengers or well-wishers wanting to have a hot meal or coffee/tea. Shops at the airport sell snacks, sweets, drinks, newspapers and magazines, and some souvenirs. These are not the Duty Free shops, which are at the departure level of the airport. I was also able to take a photo of luggage transport services counters at Narita. Unfortunately, the photo was blurry so I decided not to post it here. These transport services allow travelers with large bags or many pieces of luggage to have these delivered to their homes or hotels, allowing passengers to travel light using the trains or bus. Two of the most popular and reliable services are JAL-ABC and Kuroneko Takkyubin [with the black cat (kuro neko) logo]. The President of the Republic of the Philippines delivered the State of the Nation Address (SONA) last July 22, 2013. 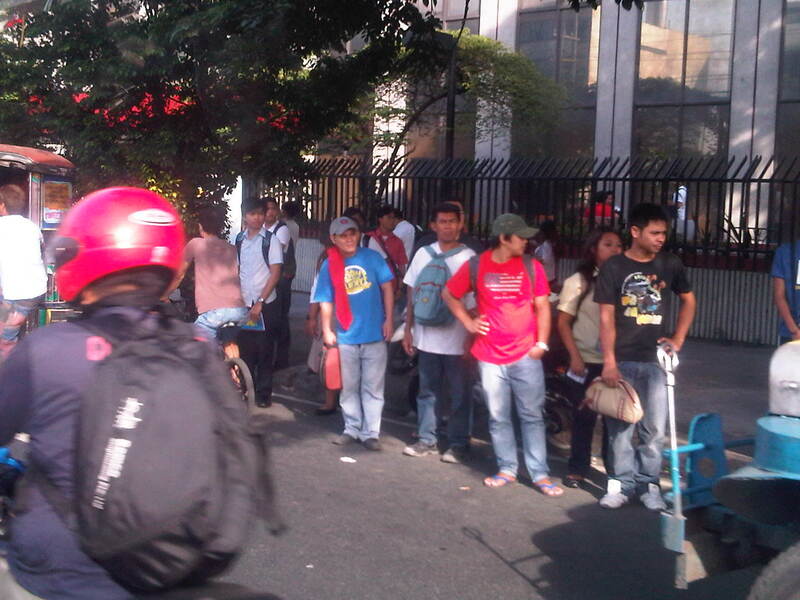 The SONA is for the mid-term as 3 years have passed since the current president was elected into office. The address was most awaited by a lot of groups. These include allies of the administration and those who have been critical of the administration. For the latter group, they would have been interested to see/hear what the SONA will report on for what seemed to them was a slow pace in the introduction and execution of reforms as well as the slow implementation of programs and projects including those regarding transport infrastructure. Of course, there is not a short supply of sycophants in Congress as in the past administrations, who would easily clap their hands at the slightest hint of accomplishment that is mentioned in the SONA. I pity their constituents who are responsible for voting them into office. While the speech mentions a lot of gains in all fronts of the so-called war against corruption following the administration’s policy for “matuwid na daan” (straight path), the details or information most useful for people dealing with policy and technical assessments are found in the SONA Technical Report. This report is supposed to have been written based on the inputs provided by government agencies and is a more comprehensive, if not the most comprehensive, material documenting what has been accomplished so far. More importantly, it is supposed to contain material on what the administration looks forward to seeing through until the end of its term in 2016. There is the opinion that it would have been better if the report and the speech followed an outline similar to the Medium Term Philippine Development Plan (MTPDP 2011-2016) so that the reported accomplishments can be placed side by side with what the administration set out to do at the start of its term. Then, it would be possible to gauge clearly where we are and if indeed we are heading towards achieving our targets by 2016. The transcript and video of the 2013 State of the Nation Address may be found in the Official Gazette of the Republic of the Philippines. That link is for the speech delivered in Filipino and a translation in English may be found through a link right after the end of the transcript. Similarly, there is a link SONA 2013 Technical Report found after the link to the translation. 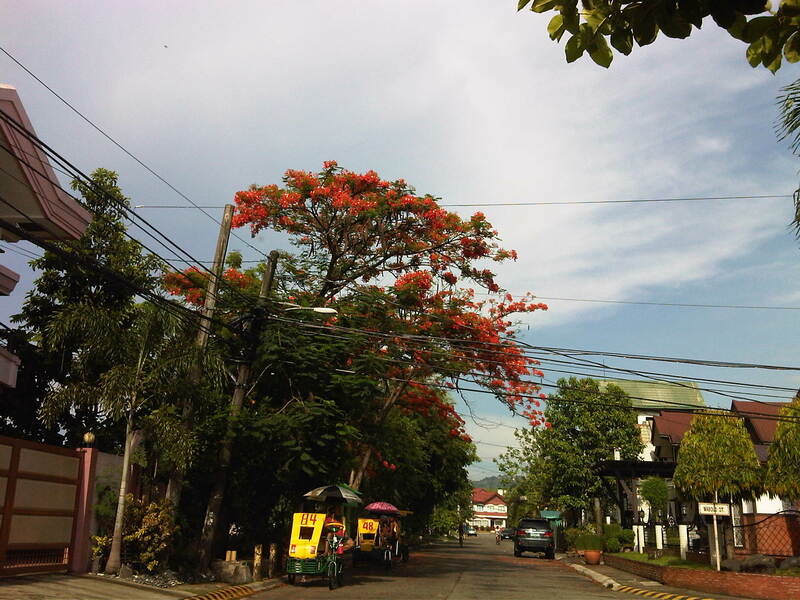 I’m posting more photos of the streets around Mapua and Lyceum. 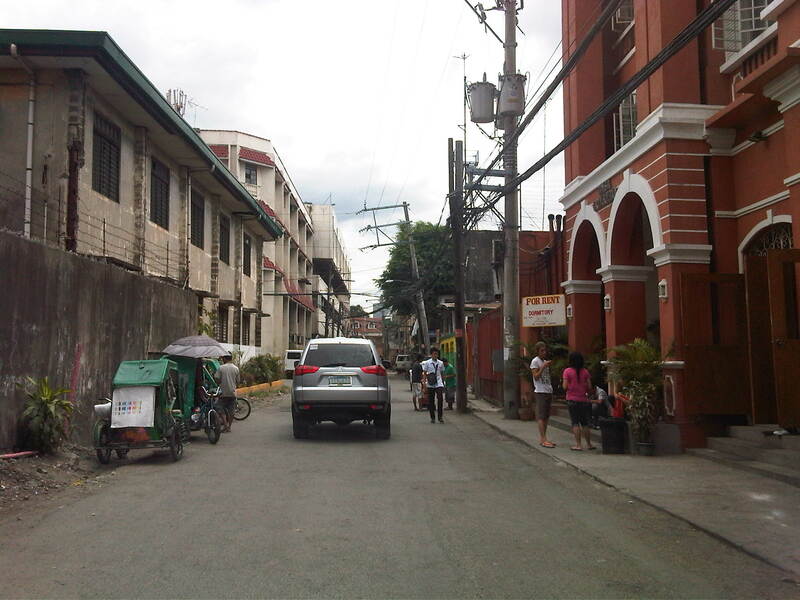 Solana Street is behind Mapua and practically runs parallel to Muralla Street. 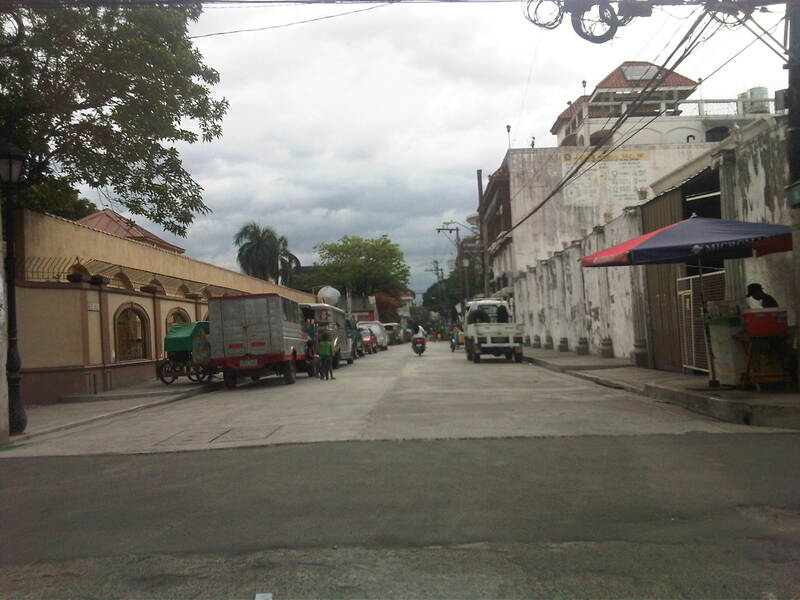 The southeast end of the street is at its junction with Victoria Street at the Manila Science High School while the northwest end is at the junction with Muralla St. and Andres Soriano, Jr. Ave. at Plaza Espana, where located are the ruins of the Maestranza and the Intendencia. 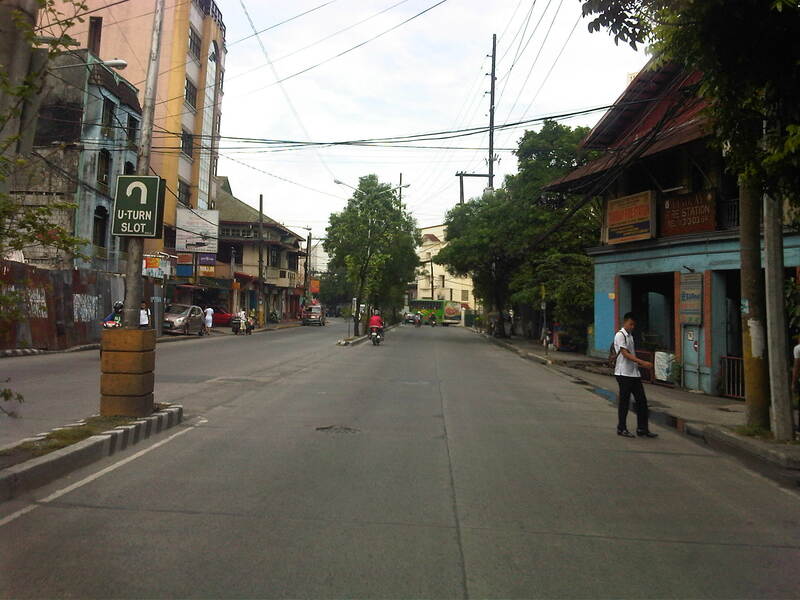 Intersection of Solana Street with Beaterio Street with an informal pedicab terminal at the corner. A newly built or renovated building is at right across from Mapua. There are many buildings hosting dormitories or rental rooms for students in the area. This is similar to buildings near institutions in the University Belt area where now stands many high-rise condominiums also catering to students. 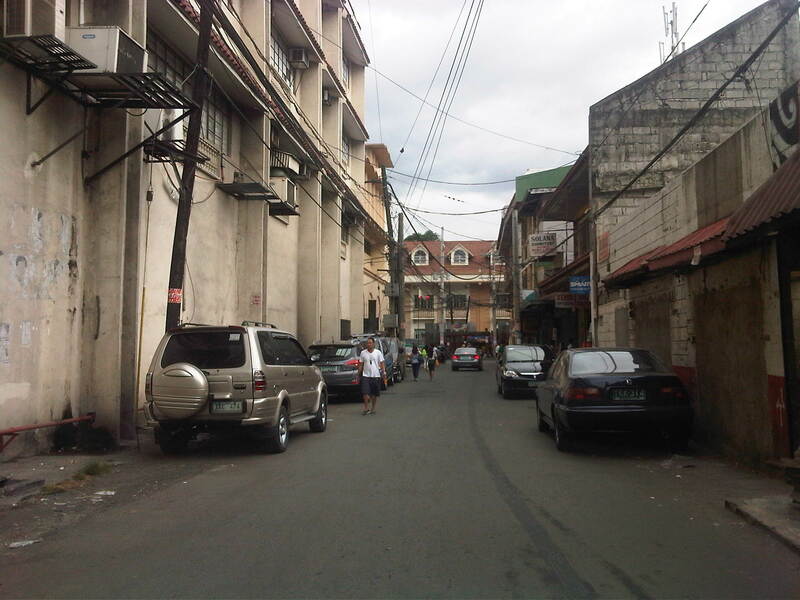 Intersection of Solana Street with San Francisco Street (left), which leads back to Muralla Street and the Lyceum. Intersection with Sta. Potencia Street – we caught an amusing sight of these two people who appear to be compacting the asphalt concrete transition between Solana’s lower pavement surface elevation with the Sta. Potencia’s new PCCP. Approaching the intersection with Victoria Street, one sees many signs of businesses geared towards the academic nature of institutions in the area (e.g., photocopying, bookbinding, computer rentals, etc.). 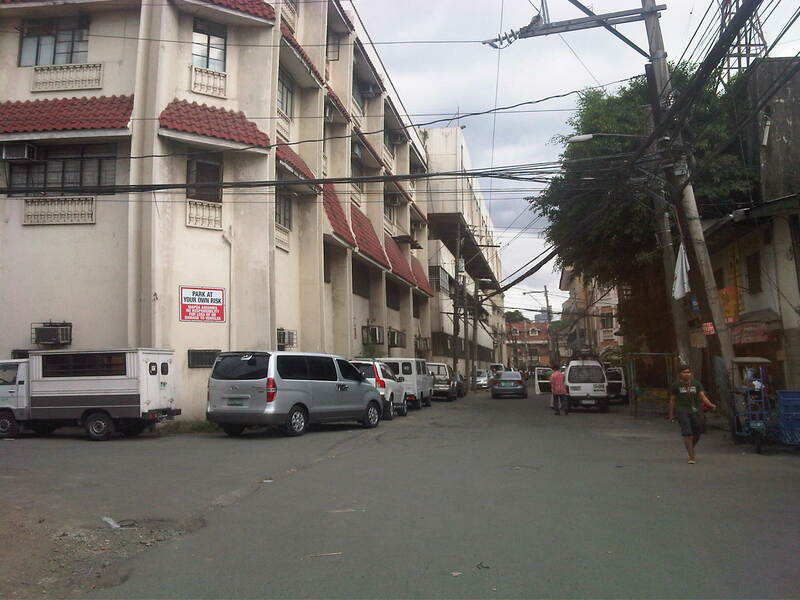 The building on the left is Mapua’s while the ones on the right include dormitories or rental apartments on the upper floors. Walking to the jeepney terminal for a ride to the university, I was irritated by the constant honking behind me as motorcycles rode up the sidewalk to avoid the weaving into congested traffic along Aurora Boulevard. And so I tried to stand my ground allowing only half the space of the sidewalk for these motorcycles to pass through. As far as I’m concerned, I was already too generous giving part of the space that is for pedestrians and not for motorized traffic. Still, there were a few motorcyclists who seem to think they had the right of way as they attempted to convince me give up more space so they could practically take over the sidewalk. I didn’t give way and assumed they were cursing me inside their helmets. Manigas sila! I thought that in the end, sila ang asar at talo in this situation, not me. At one point, I held my ground and didn’t give way to the motorcycles behind me [Advisory: This is not for everyone especially those who are “pikon” or who are looking for a fight.]. I knew my rights and I was walking on the pedestrian sidewalk. Unfortunately, a bicycle came along and I gave way only because I also appreciated cycling and understood that pedestrians and cyclists are sort of “kindred spirits” in a world dominated by motorized transport. The bicycle was immediately followed by two motorcycles including one that almost sideswiped the cyclist. I took the photo above to better show the situation. 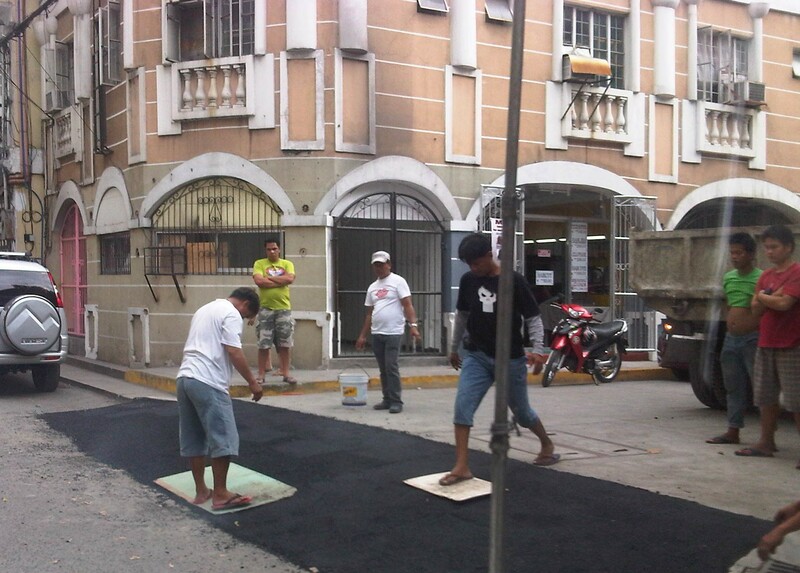 The other day, I chanced upon a similar situation as I was driving in heavy traffic along Amang Rodriguez in Pasig City. 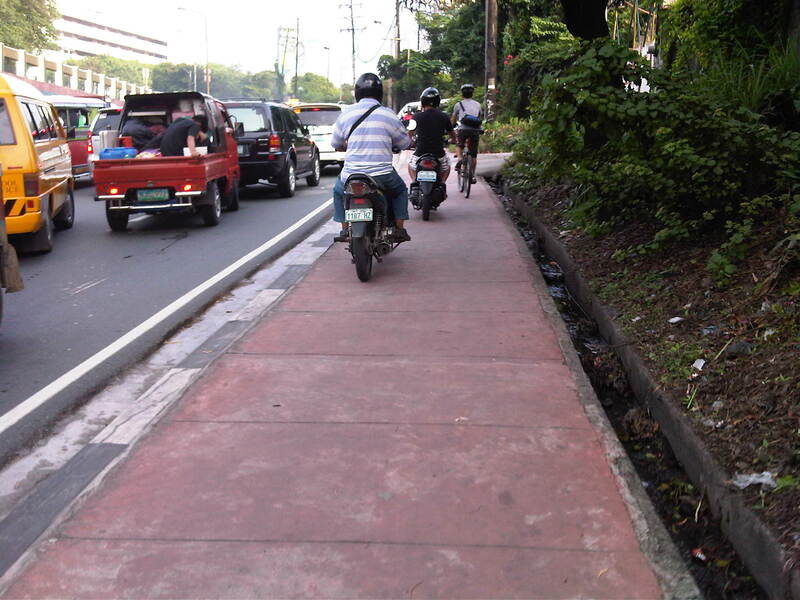 What little space was available for pedestrians along a narrow sidewalk along this road connecting Marikina and Pasig cities. These cases are clear examples of swapang attitude or behavior that is prevalent among many road users. Unfortunately, these are not apprehended or accosted by traffic enforcers. The latter seem to be more engrossed with number coding and swerving violations, anyway, that they seem to have forgotten all the other traffic violations that included this brazen behavior of motorcyclists. Perhaps enforcers should go back to the basics and take more notice of all those other violations (e.g., speeding, counter flowing, beating the red light, beating the green light, etc.) to improve and promote discipline on our roads. Pedicabs are among the most common modes of public transport around the country. These are usually found in residential areas including subdivisions or villages where they provide services to people who find it far to walk between their homes and the village gate. However, in many other places, particularly in the rural areas, pedicabs along with tricycles represent the main public transport mode for short trips. And because the main roads connecting barangays or barrios may be national roads, one will find these non-motorized transport traveling along national roads and clearly violating a law prohibiting such transport from using the national highways. Pedicabs serving rural areas are often tolerated because of a lack of convenient public transport services in barangays. 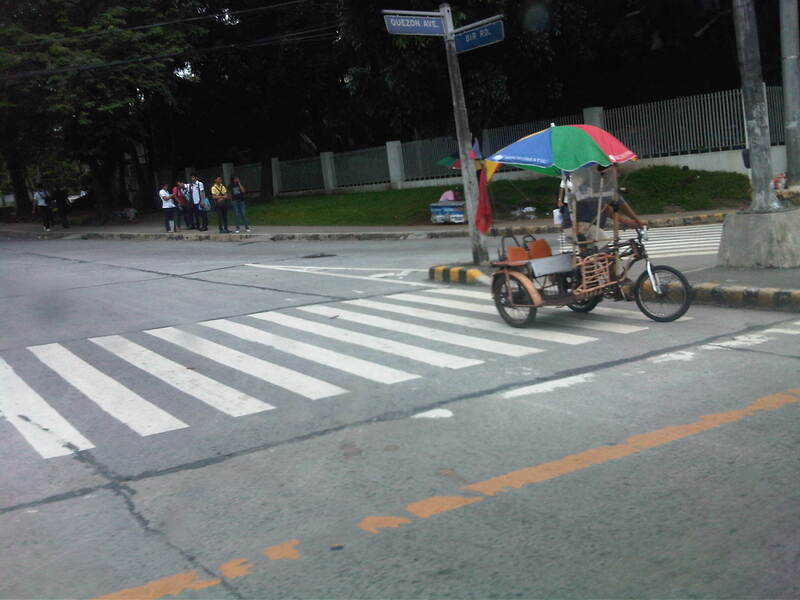 Many communities that happen to be located along national highways are often served by pedicabs (and/or motor tricycles) since jeepneys or buses come along quite sporadically, especially during the off-peak hours. Their drivers and passengers though are often at risk from motor vehicles, especially buses and trucks, that travel at higher speeds and with which crashes are highly likely to result in fatalities. This guy earns 10 pesos for a special (single passenger only) ride from the national highway to the Leyte Landings monument in Palo. Normal fare is 6 pesos per passenger if you share the ride with others. It’s a decent job and the man earns an honest living pedaling his pedicab to ferry people to and from government offices around the area. Pedicab queue at the junction of national roads are quite common in the rural areas. Pedicab traveling along a national highway in Leyte. In the urban setting, pedicabs operate in many streets and in many cases travel along major roads. Many are considered nuisances in traffic as they are slow moving and do risky maneuvers. In certain cases, like Intramuros and Pasay, they are just too many and may cause congestion simply by their numbers in general traffic. One can also wonder why they are necessary in many places if the walking environment can be improved for pedestrians so that they would not need to take short rides via pedicabs. While we are aware of the social dimensions of pedicab services (i.e., mainly their being the source of income or livelihood for a lot of people), there is the view that many of these same people are misguided in their being allowed to operate so many pedicabs and thereby making many believe it is the “only” livelihood they can depend on. The local governments should be made answerable to these questions regarding pedicab proliferation where they are not suitable. 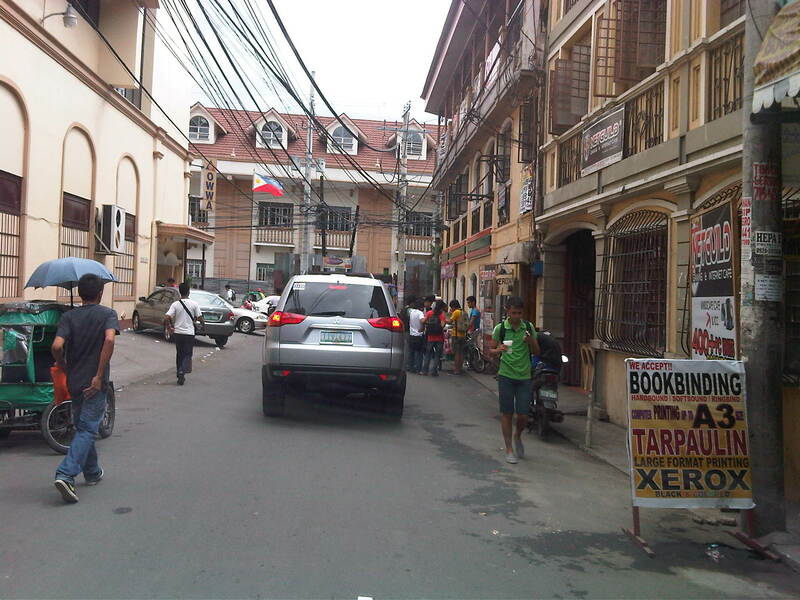 Pedicabs along a Manila street near Tutuban and the PNR station. 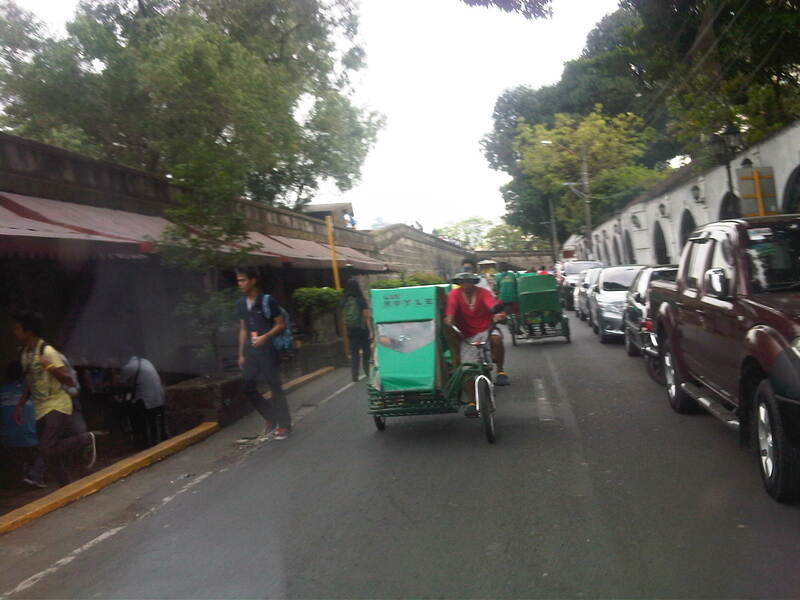 Pedicabs in Intramuros, Manila near Mapua Institute of Technology. 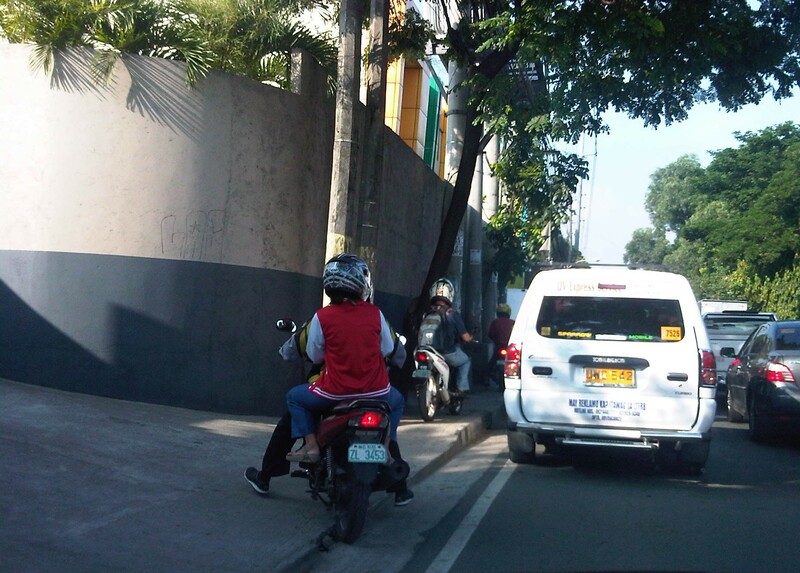 Pedicabs operating along a section of EDSA in Pasay City near the provincial bus terminals. 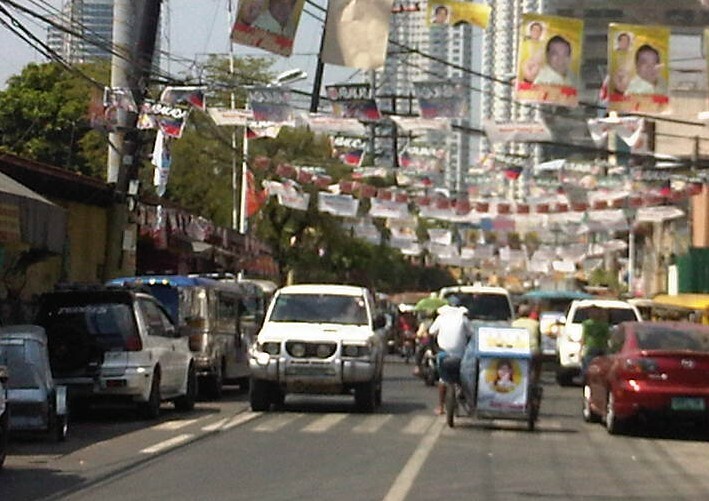 Pedicab along Quezon Avenue in Quezon City near the BIR Road and Agham Road, ferrying people from the EDSA MRT station to offices along the said roads. 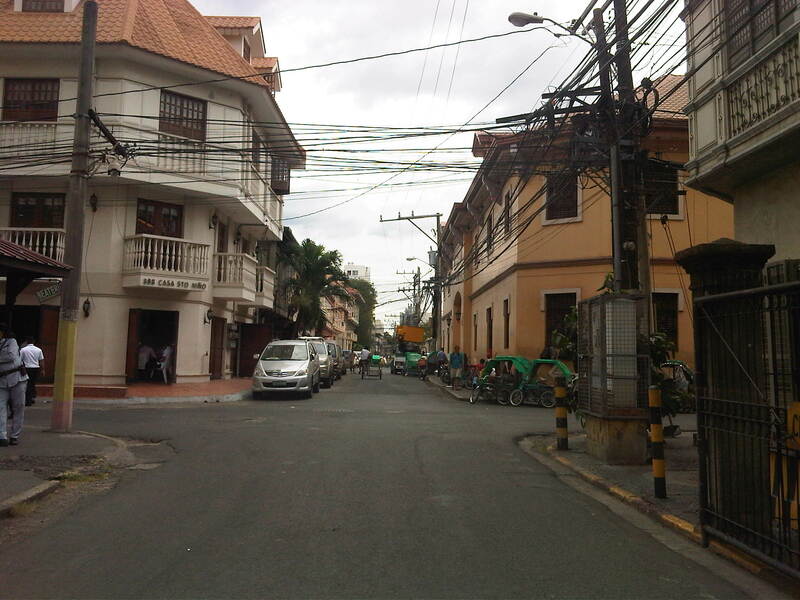 Then, of course, there are the pedicabs serving the private or gated residential subdivisions. While tricycles have been the ones to first establish services for these villages, pedicabs have become the choice for many where noise and emissions from tricycles have become irritants and serious issues to residents. The slower-moving pedicabs pose less risks to children playing on the streets or pedestrians walking on village carriageways. Pedicabs at an exclusive residential subdivision – depending on the fare policies set by local governments, barangays or village associations, pedicabs may charge somewhere between 5 to 10 pesos per passenger depending on the distance traveled, and in some cases the weather conditions (i.e., in many areas, pedicabs charge more when its rainy and especially when streets are flooded).